The Rotary Log Pavilion is owned by the City of Aberdeen and Managed by the Aberdeen Parks and Recreation Department. 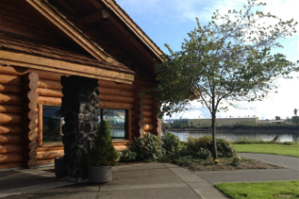 Located in beautiful Morrison Riverfront Park along the banks of the Chehalis River. In June of 1994 the Aberdeen Rotary Club donated a magnificent $1.5 million Log Pavilion to the City of Aberdeen. It was the vision of Rotarians Bob Swedblom, Jim Stamateou, Mel Flavel and John Earley. This building is the result of hand crafted Weyerhaeuser donated logs and six years of dedicated volunteer labor. Over 125 volunteers, donations from 52 community businesses and $246,000 cash from the Aberdeen Rotary Club made this unique community Pavilion possible. It truly was a community effort. There is no doubt that Grays Harbor is blessed with this wonderful meeting, events, and reception venue. Located in Aberdeen’s riverside Morrison Park the Log Pavilion offers breathtaking views of the park and the river from both inside and the outdoor Patio. There are tables and chairs to seat 200 people, a 10×10 drop down screen, full service kitchen, microphones, CD/ ipod/ player and piano.